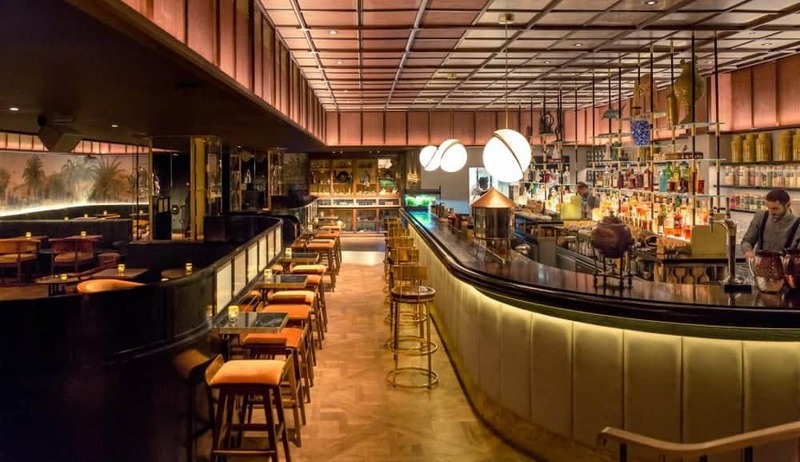 Having first opened in 2010, taking over a relatively secluded space close to East London’s famous Old Street Roundabout, Nightjar has been included within the World’s 50 Best Bars Awards top ten for the past four years, and is currently ranked as the third best bar across the whole globe. So with the rising demand, it’s unsurprising that the founders opened a huge new 120-cover space at the tail end of last year, taking over an old underground pub housed within the confines of Smithfield Meat Market. Named after the exotic bird species native across Africa, Europe, Asia, and Australia, Oriole’s name ties in with the bar’s eccentric interiors and exquisite cocktail offerings. Inside, there’s an air of Art-Deco rustic glamour of yesteryear, with the interiors heavily inspired by colonial era travel as displayed with various relics of quirky, eye-catching ephemera that dress the bar and fill glass cabinets scattered around the space, joined by tropical print wallpaper and rich green leather banquette seating. Aside from the impressive bar area that stretches across the back wall, the main focus is perhaps the central stage that’s generally frequented by musicians that perform live swing and jazz music. As is the case with the cocktails on offer here, the menu is split into three sections: ‘Old World’, ‘New World’, and ‘The Orients’, all of which are – like Nightjar – made using particularly specialist, frankly baffling ingredients and served with such finesse they seem too good to drink. For instance, the ‘Hispaniola’ chosen from the ‘New World’ section is served within a wooden lidded vessel that allows a cloud of smoke to escape once lifted. Made using Woodford Reserve whisky, combined with Graviola cordial (made using a tropical fruit also known as soursop), plantain powder, dry rinquinquin à la pêche and southernwood – a species of flowering plant from the sunflower family. The real jewel in the crown, during our visit however, was the ‘Bayou’; a sharing cocktail that’s intended to be shared between five and six people, very reasonably priced at £50 (less than £10 per head). Also featuring Woodford Reserve as its base spirit, the whisky is combined with potent absinthe treacle, alligator pepper, yellow grapefruit and trompette de la mort mushrooms. 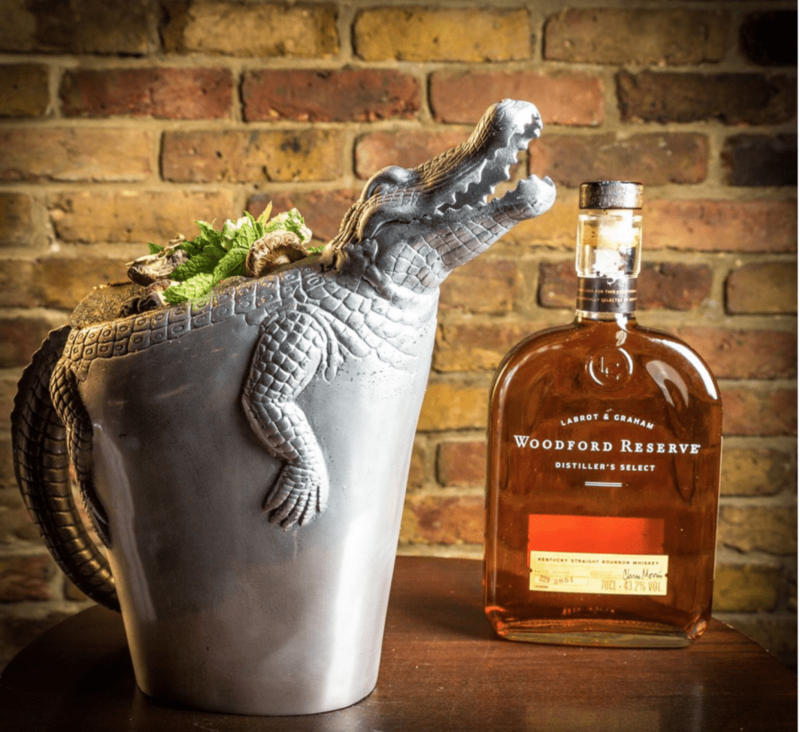 What’s more, the drink inspired by the alligator frequented lakes of America’s deep south, is served within a kitsch pewter pitcher in the shape of an alligator, pouring the remarkably tasty concoction from its mouth like an adult watering can. At Oriole, the combination of expertly crafted and delightfully presented drinks, friendly staff, and a fun idiosyncratic atmosphere all contribute towards a thoroughly enjoyable experience, gloriously disengaged from the bleak meat market that’s situated just steps away. Following the recent visit, this week’s cocktail recipe is for to Oriole’s ‘Bayou’ – a drink that does feature some specialty ingredients, but is certainly worth the effort of recreating at home, alligator pitcher optional. To make the Absinthe treacle, simple add absinthe to treacle to taste, and blend. Beware, a little goes a very long way. Next, blend the ingredients thoroughly so that the mixture does not separate and serve. Note: alligator pepper is a West African spice that can be sourced from various specialty food stores and online outlets. Oriole can be found at East Poultry Avenue, Smithfield Markets, London, EC1A 9LH.